Regular computers, while amazing, are not amazing enough for the doughty researchers at the National Institute of Standards and Technology (NIST). 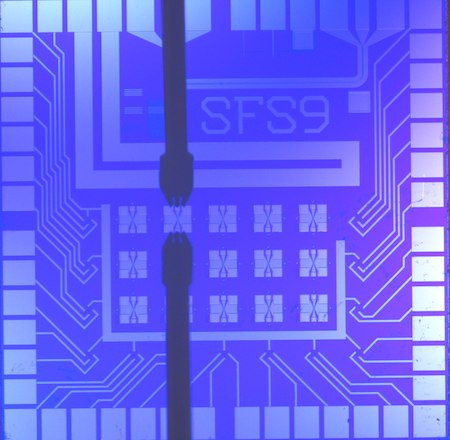 They've developed a superconducting “synapse” that “learns” like a biological system. is located at the center of each X. This chip is 1 square centimeter in size. NIST’s artificial synapse is a metallic cylinder 10 micrometers in diameter — about 10 times larger than a biological synapse. It simulates a real synapse by processing incoming electrical spikes (pulsed current from a neuron) and customizing spiking output signals. The more firing between cells (or processors), the stronger the connection. That process enables both biological and artificial synapses to maintain old circuits and create new ones. Operating at 100 GHz, it can fire at a rate that is much faster than the human brain — 1 billion times per second, compared to a brain cell’s rate of about 50 times per second. It uses only about one ten-thousandth as much energy as a human synapse. The spiking energy is less than 1 attojoule** — roughly equivalent to the miniscule chemical energy bonding two atoms in a molecule — compared to the roughly 10 femtojoules (10,000 attojoules) per synaptic event in the human brain. Current neuromorphic platforms are orders of magnitude less efficient than the human brain. “We don’t know of any other artificial synapse that uses less energy,” NIST physicist Mike Schneider said. The Nexus-6 did have two trillion constituents plus a choice within a range of ten million possible combinations of cerebral activity. In .45 of a second an android equipped with such a brain could assume any one of fourteen basic reaction-postures. Well, no intelligence test could trap such an andy. But then, intelligence tests hadn't trapped an andy in years, not since the primordial, crude varieties of the 1970's. Don't forget about the electronic analog of living brain from Frederik Pohl's The Tunnel Under the World. Fires faster than brain at 1/10K energy.